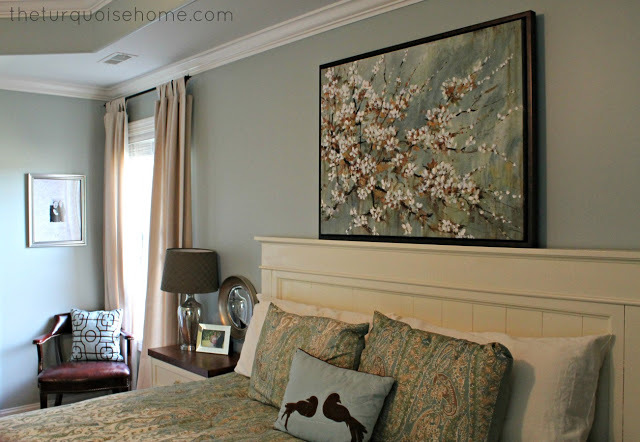 It has been a while since I have featured a fun DIY headboard, so this fun DIY farmhouse headboard seems like a good one to dip my feet back in the water. We still need a headboard too. It helps that this one does not require finding an old door to repurpose. Just some cuts made by the home improvement store (if you don't own a miter saw) and a carpenter square. Okay, she used a nail gun and drill too, but I bet you could get away with a hammer and everyone should have a drill! You can check out how to make a DIY farmhouse bed over at The Turquoise House. You totally could use a hammer and a drill. Such an easy project and it's so satisfying to take a pile of wood and turn it into something useful and beautiful. Thank you so much for featuring my headboard!! I'm thinking this would be PERFECT for my place. Still no headboard and a great antiques shop across the street would make this an easy project!